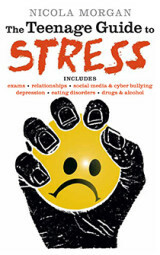 Factual books don’t get many chances to win awards so I was thrilled when The Teenage Guide to Stress was shortlisted for the fabulous School Library Association awards for “information books”. The award ceremony was last week, on my birthday, as luck would have it. And luck would have it that TTGS won both the readers’ choice and the judges’ choice in its age category. Crikey! I was stunned! I was a lot happier than I look in this photo. I am stressed in the photo and doing one of my wan smiles that really aren’t smiles even though they are trying to be. Mainly because I find all photo-taking stressful. But inside, trust me, I was SO bloomin happy. 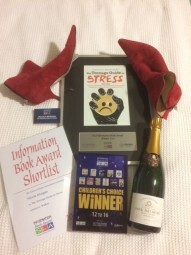 I am on record as praising the value of school librarians and their crucial role in creating each generation of readers and it was a huge honour to receive these awards from such an important body of people. 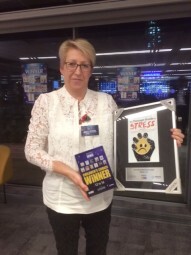 And big thanks to them for honouring and valuing non-fiction equally with fiction and encouraging children to choose their reading material freely. I had a lot to carry home to Edinburgh on the train next day but I’m not complaining one bit. Especially as I’d taken the lucky red boots off by then. That’s just brilliant news Nicola and so well deserved. Well done you – and the red boots too, of course!